You start with the best of intentions to make a wonderful batch of pistachio macarons for MacTweets since your first batch were as plain as plain can be. Then you realise that today is posting day, that tomorrow night will be hectic and you are going to be away all weekend. What’s a girl to do? 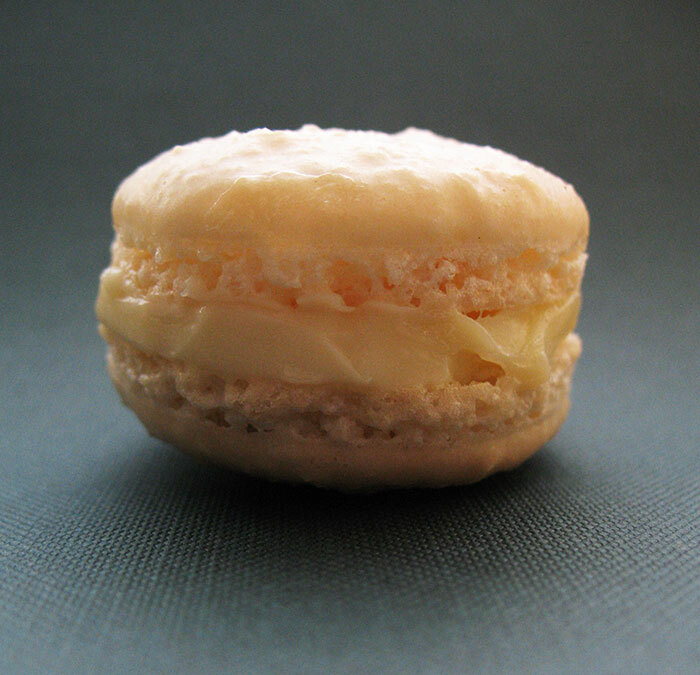 Well technically it’s not cheating because I did make these macarons, and I did make them using the MacTweets recipe. Back in November when I actually made these macarons I was so chuffed that they just had feet! Now of course I look at the photos and think – wow, they are a bit lumpy! That was with buying pre-ground almonds, so maybe I just need to mix them more. This was the sample recipe given, as you may be able to tell that I did not add the violet sugar or candied violet petals. I used a white chocolate ganache I had leftover from some other baking escapades. In a stand mixer fitted with the whisk attachment, whip the egg whites to a foam, gradually add the sugar until you obtain a glossy meringue. Do not overbeat your meringue or it will be too dry. Combine the almonds and powdered sugar in a food processor and give them a good pulse until the nuts are finely ground. Add them to the meringue, give it a quick fold to break some of the air and then fold the mass carefully until you obtain a batter that flows like lava or a thick ribbon. Give quick strokes at first to break the mass and slow down. The whole process should not take more than 50 strokes. Fill a pastry bag fitted with a plain tip (Ateco #807 or #809) with the batter and pipe small rounds (1.5 inches in diameter) onto parchment paper or silicone mats lined baking sheets. Sprinkle with the crushed sugar or violet petals. Preheat the oven to 280F. Let the macarons sit out for 30 minutes to an hour to harden their shells a bit and bake for 15 to 20 minutes, depending on their size. Let cool. If you have trouble removing the shells, pour a couple of drops of water under the parchment paper while the sheet is still a bit warm and the macarons will lift up more easily do to the moisture. Don’t let them sit there in it too long or they will become soggy. Once baked and if you are not using them right away, store them in an airtight container out of the fridge for a couple of days or in the freezer. To fill: pipe or spoon about 1 big tablespoon of butterceam in the center of one shell and top with another one. Jamie and Deeba over at MacTweets are so helpful and enthusiastic to hear your progress, which is especially great when no one else around understands what is so important about “feet”. If you have been putting off making macarons, don’t any longer! Especially if you were forced to go through, or read about, that terrible Daring Bakers challenge. Why not join MacTweets? It definitely gave me the incentive and help to try again.